Stephen A. Bean Municipal Airport in Rangeley, Maine. The Rangeley Lakes Region can be reached by driving or flying. Via highways, from the south take either Route 4 (through Farmington, Maine) or Route 17 (through Rumford, Maine). From the west, follow Route 16 through Errol, New Hampshire and Wilsons Mills, Maine. All routes into the region are 2 lane highways and offer beautiful mountain and lake vistas…and the occasional moose sighting! Click here for a mileage chart! 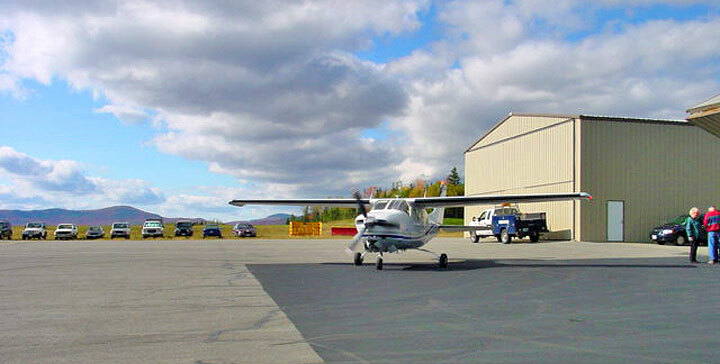 In Rangeley, the Stephen A. Bean Municipal Airport serves Rangeley and Franklin County and is owned by Town Of Rangeley. The facility’s paved runway extends for 3,200 feet and is located at 101 Kennebago Road at an elevation of 1,824 feet. Aircraft charters and scenic aerial tours are available through Lake Region Air. Other services and amenities include aviation fuel, aircraft parking (ramp or tiedown), a flight school (flight training), and aircraft rentals. For more information about the airport call the town office at 207-864-3326. Also serving the area is the Sugarloaf Regional Airport and the seaplane base on Rangeley Lake. Float plane tours are offered out of the Rangeley Lake seaplane base by Acadian Seaplanes. I’d like information about getting in and out of the Rangeley area, particularly Rangeley-Boston and Rangeley-Long Island, NY. Are there commercial flights out of the Bean Airport?